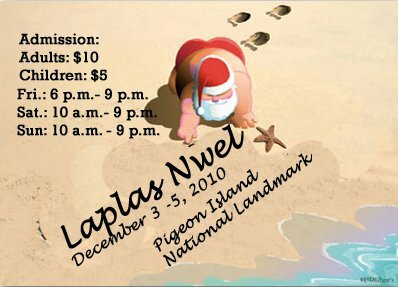 There is no other place to celebrate christmas like in the Caribbean. Warm weather, lots of great food and drinks, family and friends. I've even seen Santa water skiing! So 2 weeks ago, my friend Mala was shocked to hear bamboo bursting in her neighborhood in St.Lucia. A christmas tradition usually heard in late November. Boys and men in the neighbourhood hollow out bamboo to make cannons, carefully choosing sticks to use as fuses and fill a bottle with kerosene and plug it with a rag to make a lantern. They raise the front end of the bamboo on stones, pour kerosene in the top, put the fuse in the other end and light it with the lantern which results in boom echoed through the neighbourhood. Rihanna just dropped a new track too, adding some reggae flavor to her repertoire as she releases the Christmas song "A Child is Born." She even throws in a few hallelujahs in there.